Get room-filled, vibrant sound from a speaker that disappears into your decor without sacrificing your floor space. RBH Sound in-ceiling speakers install flush in your ceiling. They are practically invisible with a paintable, low-profile grille and hidden flange. 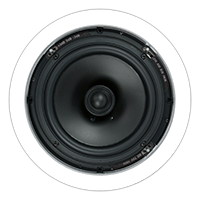 The A-605/70 is the budget minded answer for both residential and commercial in-ceiling speaker applications. The A-605/70 employs a poly graphite woofer cone and a soft dome tweeter for great sound on a budget. Other amenities include a UL listed integral rear enclosure and a built-in multi-tap transformer, enabling the A-605/70 to be used with either 8 Ohm or 70/100 Volt audio systems. The A-605/70 provides full-range performance while exceeding building code compliance. Provides full-range performance while exceeding building code compliance.